During the World Series game on October 25th, there was a stolen base! 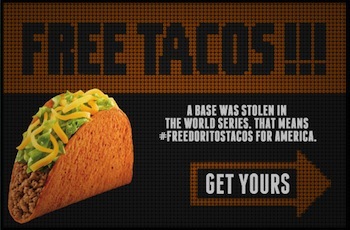 That means that you can get a FREE Doritos Locos Taco at Taco Bell on October 30th. Just stop by and grab yours anytime between 2pm and 6pm. Has anyone tried this taco before? Is it any good?